Many central Massachusetts home owners use automated irrigation systems to irrigate their lawns and ornamental plants. 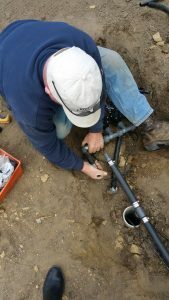 While the systems are installed to provide minimal maintenance and automated irrigation, routine maintenance and repairs are required to correct component failure and damage. Now is the perfect time to do maintenance and repairs – before summer’s heat and dry conditions take hold. We want your irrigation system to be set appropriately for these conditions and make the best use of the watering schedule. Prompt repair of irrigation system problems prevents loss or damage to landscapes and wasted water. Identifying and correcting the specific problem can prevent additional harmful impacts. For example, dry areas in a landscape can appear to be lacking water, but the lack of water may be due to a broken sprinkler or some other problem causing a loss of pressure in the irrigation system. Simply setting the irrigation timer to a longer run time will not make up for dry areas occurring from leaks, clogs, or broken irrigation pipe. Even if your irrigation system escaped damage this past winter, you may still find your lawn sprinkler system not performing as well as you’d like. Perhaps a sprinkler head is now under a bush that has grown out during the spring. Or maybe you need to change your automatic watering schedule or pattern to take into account changes in your landscaping. Whatever, your particular need, now’s the perfect time to call the irrigation system specialists at Mike Lynch Enterprises to get your irrigation system repaired and maintenance performed so you can be assured of a beautiful lawn and lush gardens all season long.